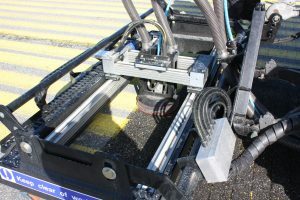 Veidekke Industri AS, Airfield solutions is an executing contractor within Runway Grooving, Installation of Shallow base lighting, Saw-cut slot for cable installation in existing pavements and Rubber Removal with water-jet. We have been grooving in most of the approx. 45 runways for Avinor, Norway’s largest owner of airports and 4 of 5 runways for the Ministry of Defence since 1997. The grooving machine is one of the Worlds largest and most efficient. 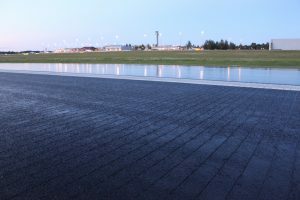 We install CAT 2/3 lights for runways, stop-bars and centerlights on taxiways. Saw-cut slotting in asphalt or concrete surface is performed with a special saw, driven by the same machine we are using for grooving. 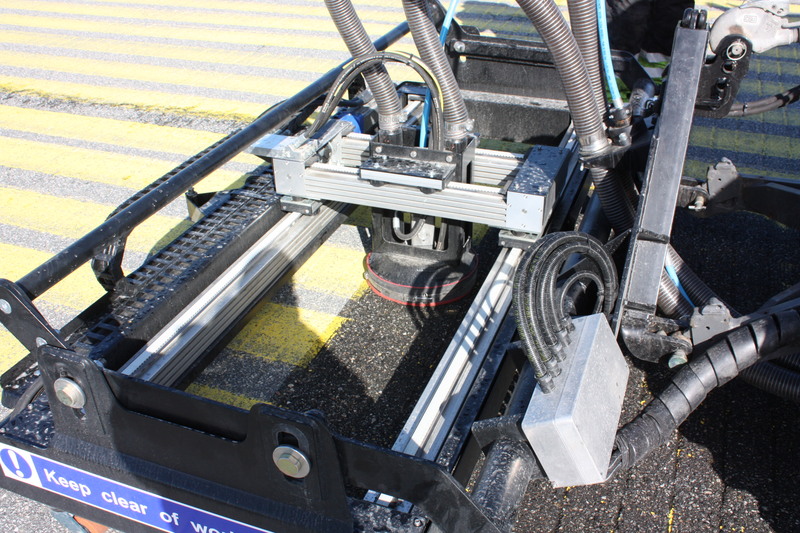 The rubber and paint marking removal quickly clean the surface with water-jets, no chemical is used in the process. 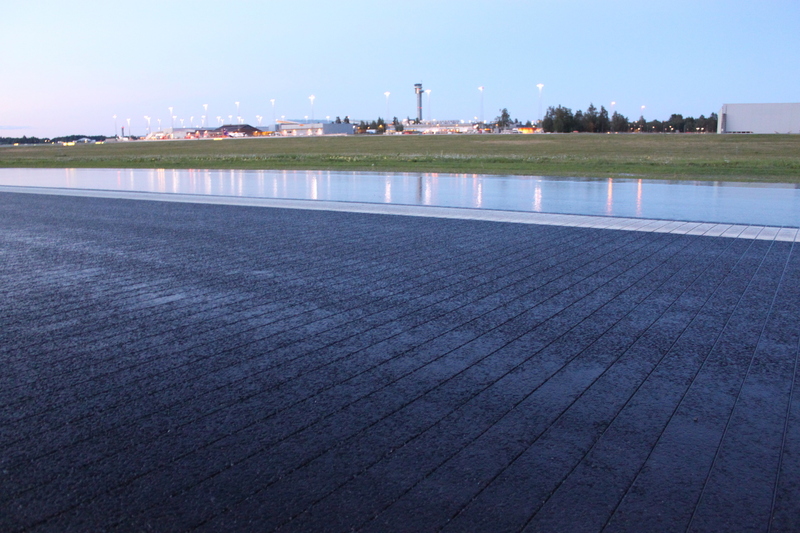 The main benefit of grooving is to drain water off the runway and reduce the drying time. This will improve the wet friction, due to less water and eliminate situations with “Shiny when wet” conditions. 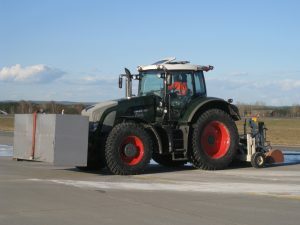 The grooves also lead to less deicing which in turn reduces the use of chemicals. This has an environmental benefit and is also a cost-effective process. During the last 16 years Veidekke have grooved 5.1 million square meters. This includes runways, shoulders and taxiways. Equipment: grooving machine 5m wide. We install CAT II/III lights for runways, stop-bars and center lights on taxiways. The shallow base is mounted in a cored hole with a resin sealer which will harden within 5-10 minutes. Capacity is 10-12 light casings in 6 hours. Saw cut slotting in asphalt or concrete surface is performed with a special saw, driven by the same machine we are using for grooving. 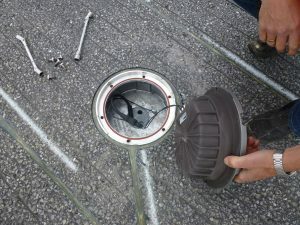 The saw-cut slots are typically 17-20 mm wide and 45-75 mm deep, depending on whether 1, 2 or 3 cables are placed for the various lighting points. The rubber and paint marking removal quickly clean the surface with water blasting. Whether it is pavement marking, rubber, curing compound removal and cleaning oil on new concrete, residue and grease from surfaces and will increase texture on polished surfaces or area with bitumen bleeding. No chemical is used in the process. Capacity 3-4000 sq. meters per hour.